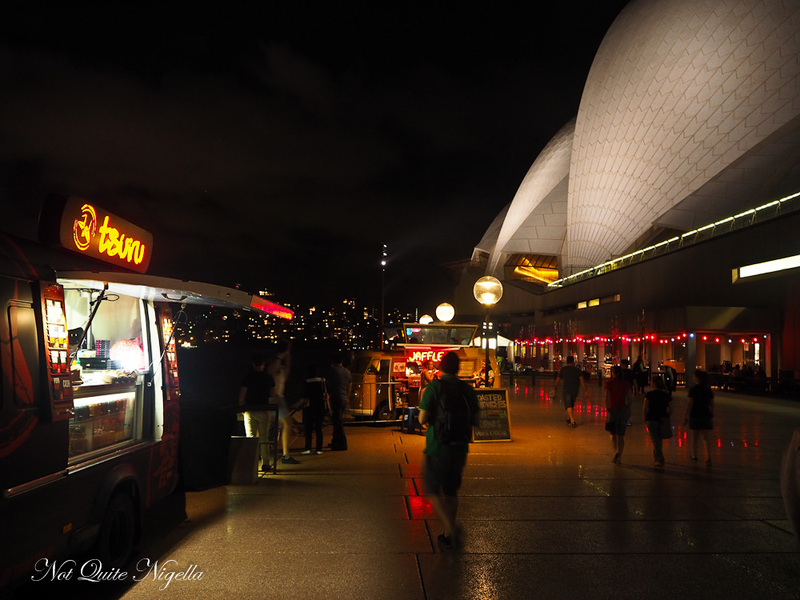 A Food Truck Dash Across Sydney! 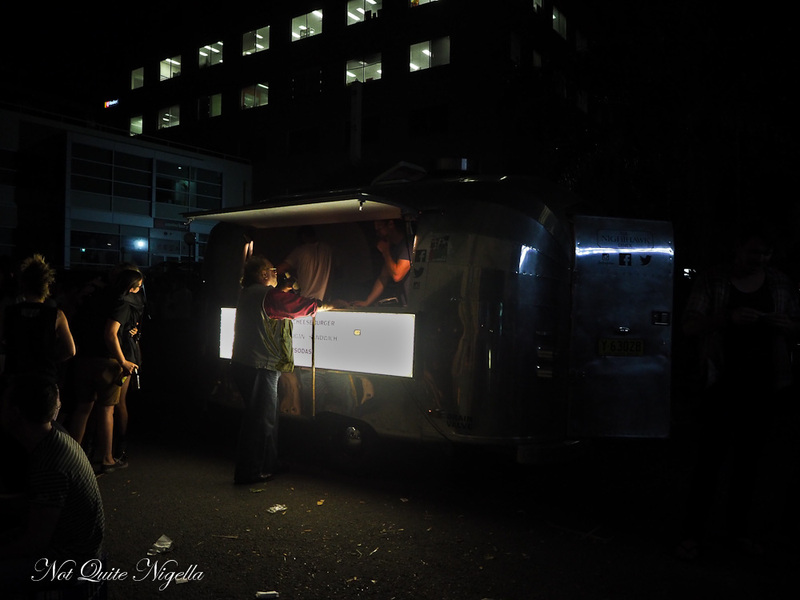 The idea was a little cross field trip across Sydney trying out some of Sydney's food trucks on a hot summer's night. Starting with Mister Gee Burger Truck in Burwood for truffle burgers we then made our way to Waterloo for a Cuban sandwich. After this it was a drive into Circular Quay for some Tsuru buns and rice bowls ending with Agape Organic for late night sloppy joes. It was a hot, hot Friday. The black asphalt of the roads emanated heat. People cooled themselves off with hoses and ice creams. Newscasters beamed stories from the beach. Everyone in Sydney complained about the weather. Then around 7pm a cool breeze blew in and cooled things off. 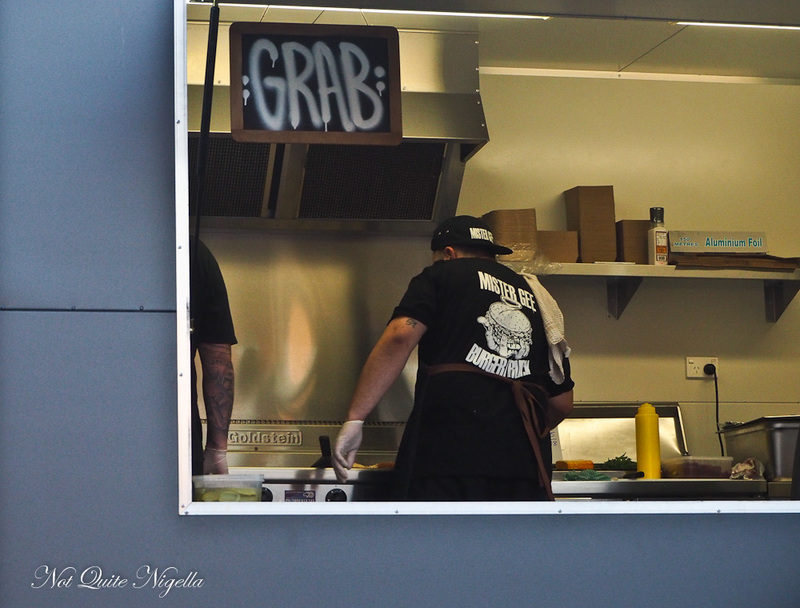 Our appetite surged just in time as we were waiting on Shaftesbury Road in Burwood for a burger. It has been a while since we had visited a food truck. Truth be told, some are a bit difficult to locate - the app isn't the easiest to use and many of them don't update their social media feeds so they appear dormant while trading so you really have to want to try one and track them down to find one. But when you do, well it's worth it. Our first stop of the evening is in Burwood. 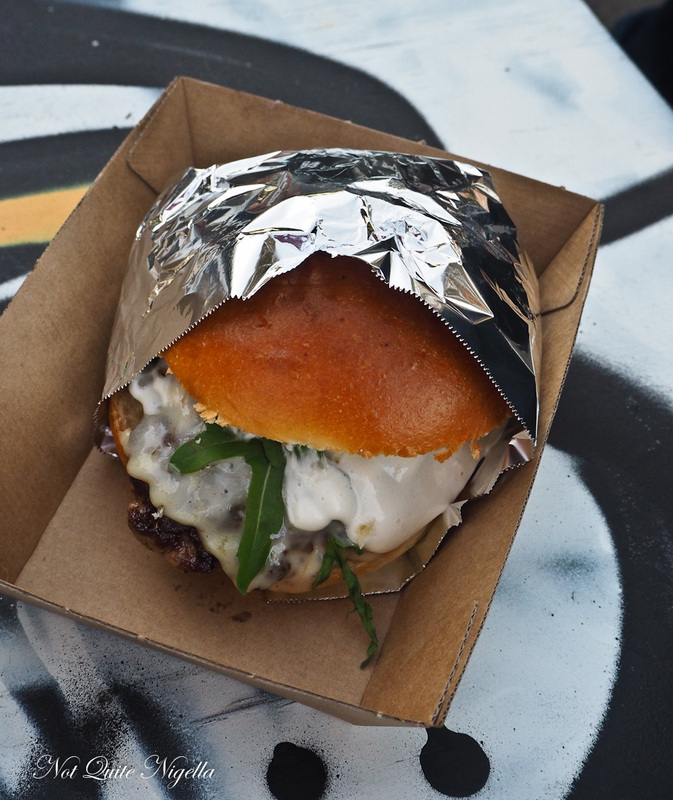 Sydney is currently in the throes of a burger wave, an obsession that we're more than happy to ride. 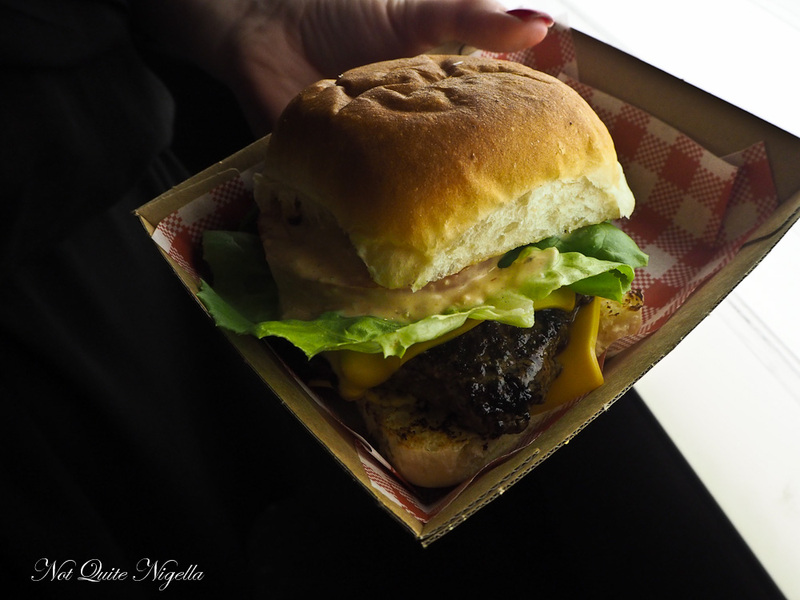 And at Mister Gee Burger Truck the menu features "The Truffe" a truffle burger that we had heard some very good things about. We are there when they open and there are just a few people waiting around sitting on milk crates but soon after cars start pulling up and it gets busy. A swarm of young guys all with hotted up cars and custom number plates referencing "69" and "YOLO" pull up. 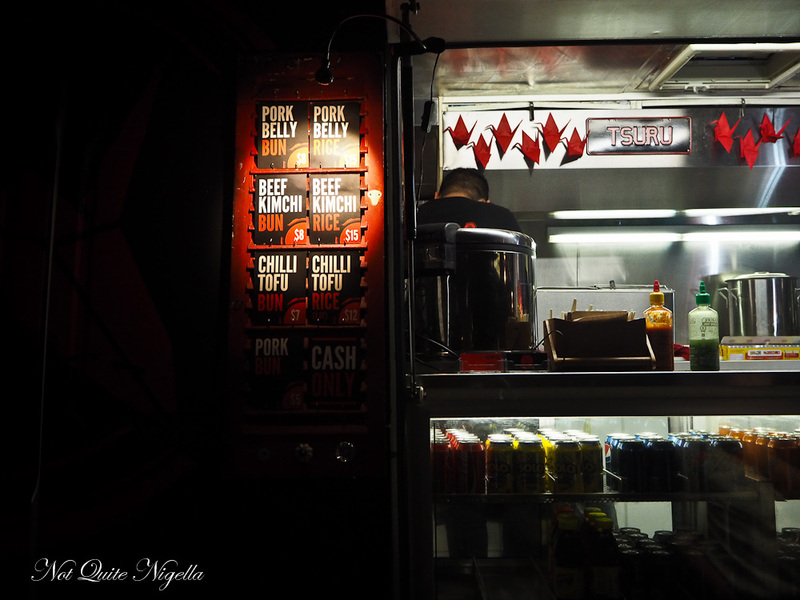 Gee Ozgen travelled to New York and Los Angeles to get a feel for the food truck scene there before starting up Mister Gee's Burger Truck in late November 2014. He rotates three burgers every week from the Cheese Boogie, Fat Boy and the Truffe (his favourite). "People can't be bothered finding where it (a truck) is so we worked on a permanent spot to make it easier for people to find us. I just wanted an industrial looking area it could have been a car park or anything," he says. His family has worked in hospitality owning cafes and takeaways since his grandfather's time in the 1960's. There are three items on the weekly changing menu and we try all three. The Brooklyn Baklava shake is just the right consistency, not too thick and not too thin and features finely blended up pieces of baklava. It's delicious and just the right level of sweetness too, especially for those that may find baklava too sweet. There are two types of fries: regular French fries or Chilli Cheese Fries. We order the latter and they are French fries topped with cheese and squiggles of a curry flavoured chilli sauce. The tangy, spicy sauce goes well with the fries and we fish out fry after fry. And then The Truffe arrives. The brioche bun is warm and lightly toasted, there is a grass fed beef patty inside with melted havarti cheese and rocket. And then there is the sauce heady in truffle made with truffle oil. "The most important thing is the patty. We use a good grass fed beef we get from Tasmania and there are certain cuts of beef that we use. It's fatty but not too fatty," Gee explains. It could be on the menu of any fancy steak house menu and be right at home there. 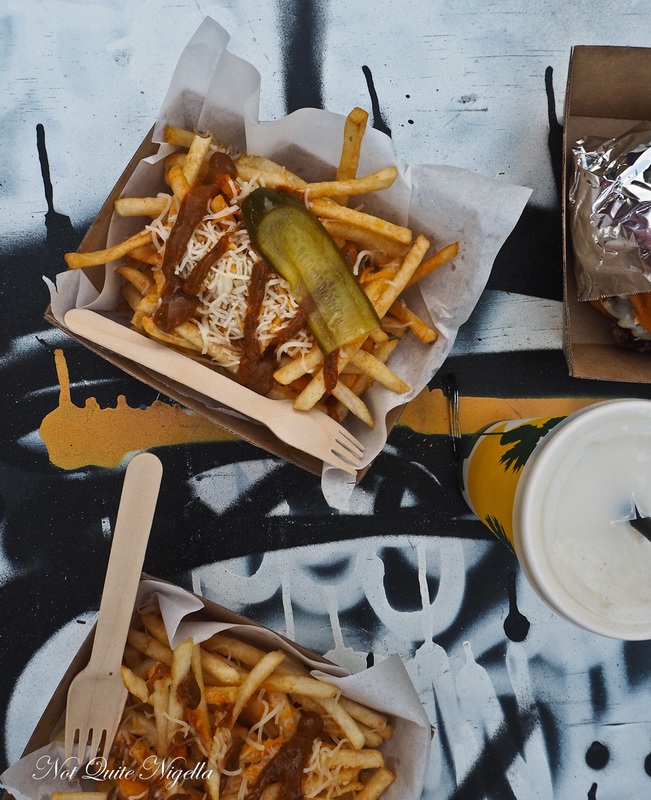 Here it just happens to be just $10 and we're eating it outside a food truck while sitting on a milk crate. And that's why we suspect people love a food truck. "It's like Little Austin in Texas here!" exclaims Belinda and she's dead right. This tiny side street in Waterloo is somewhere where you'd have to purposely want to visit as you wouldn't know about it otherwise. But parked outside the Ambush Gallery among the hipsters and hippies is where we find the silver trailer called "Queen Latifa". Fine dining chefs Al and Jim have had an obsession with America and American culture and this reflects in the menu that changes regularly. 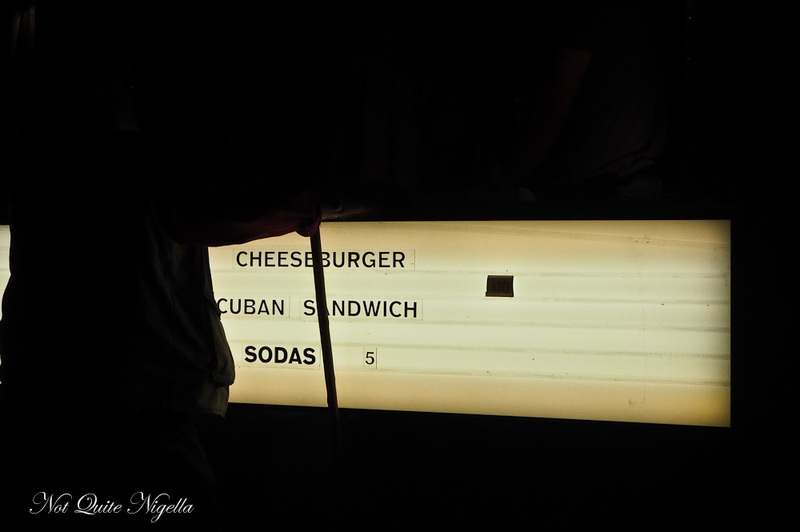 Tonight, the crowd is dining on Cuban sandwiches and cheeseburgers. It's straight from a scene from the movie Chef and ever since watching it, I have craved a Cuban sandwich. We order one of each and stand aside to eat them standing up (there is nowhere to sit unless you want to grab a piece of pavement). The cheeseburger is an excellent specimen of cheeseburgerdom. A soft, fresh warm bun encases a beef patty with two slices of cheese, tomato, lettuce and a sauce. The bun is very soft, so soft that the bottom half almost disintegrates and it's a sizeable burger too. My eyes were really for the Cuban sandwich though. Cuban sandwiches are more from Florida than Cuba itself and usually have ham, roast pork, pickles and cheese. 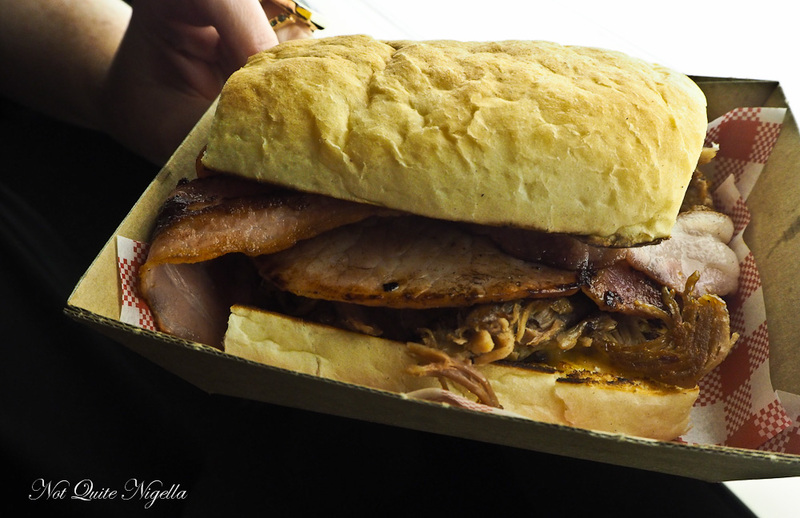 This one has bacon, cheese and soft shreds of roast pork. It's enormous and the bread is excellent, also soft and downy. I would have loved pickles for contrast but I warn Mr NQN that we might be on some Cuban sandwich runs when peckish. We cross the city to the Opera House for our next food truck and for a change of pace from the burgers. 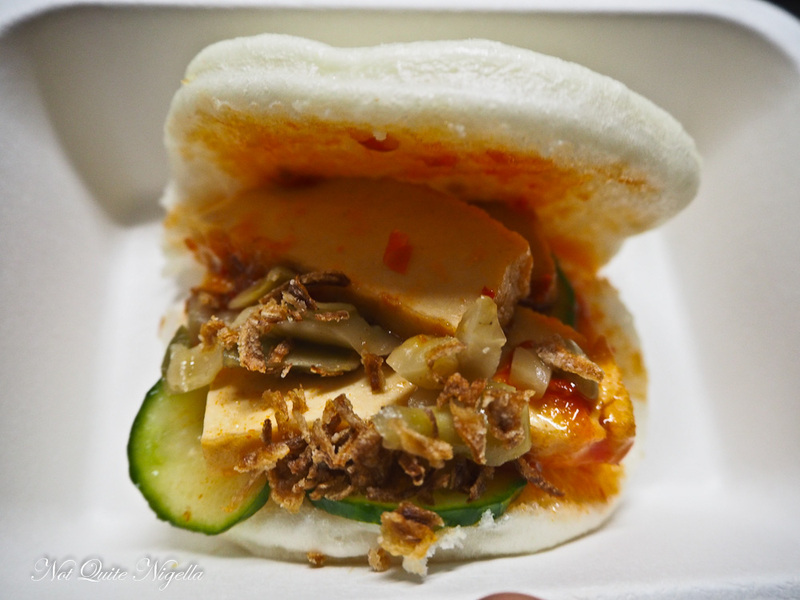 Tsuru, run by Ellyn Tse is a food truck sells Asian buns filled and rice bowls. Tonight it is positioned on the upper level of the Opera House, and depending on the angle it is almost camouflaged against the dark night sky. "Growing up in Asia I’ve accustomed to buying food out of a stall on the side of the street, sitting on an old wooden stool by the kerb slurping noodles. So naturally when food trucks started to make their noise over in the US I thought what a brilliant concept! It was a good few years before Melbourne caught up, and when Sydney finally joined in I jumped at the chance," Ellyn says. 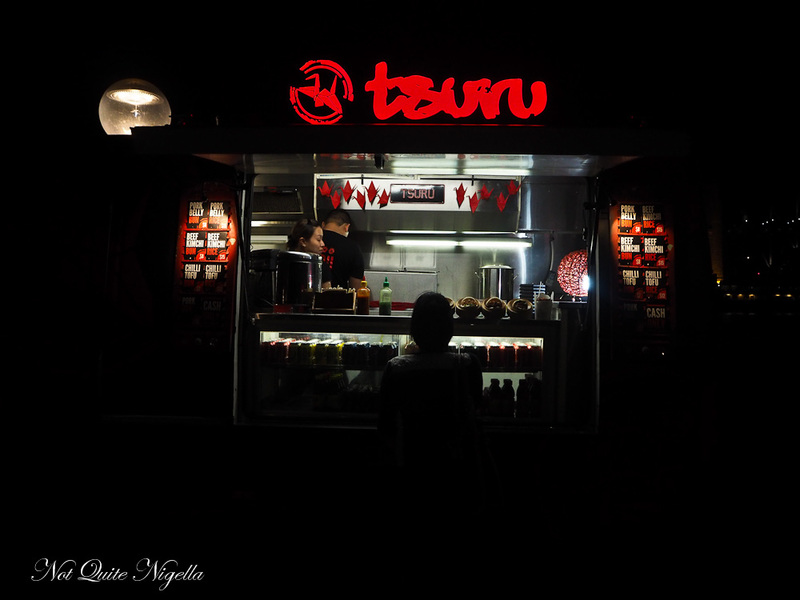 Right next to Tsuru is another food truck selling jaffles. Ellyn explains that, "We find that we always trade better when put together with all the other trucks than if we were to be put separately in different locations within the same festival." The menu is neat and fillings are either available in a bun or over rice and we choose two in a bun and one over rice as we're all getting quite full. 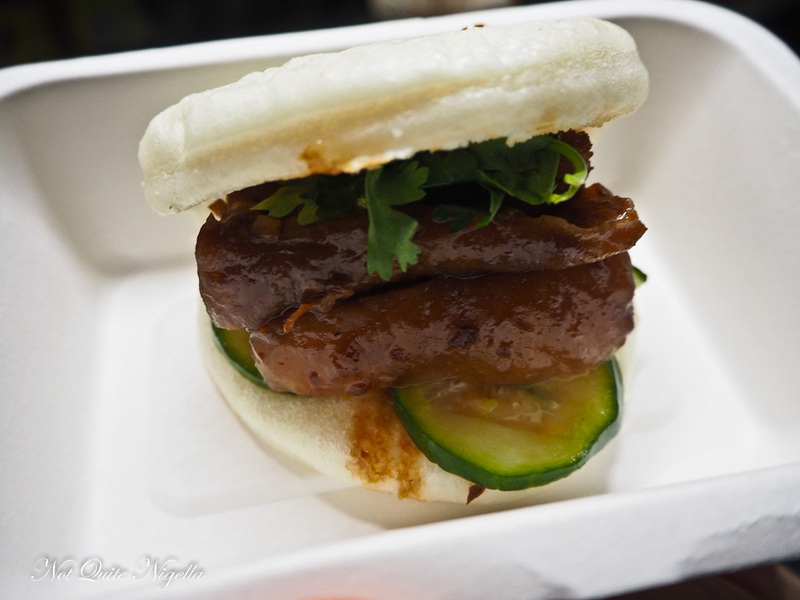 The number one best seller is the pork belly bun. Full of two thick slices of soft, jellied pork belly the bun is downy soft and matches the softness of the pork belly. It's the kind of bun where you might want to order two because you don't want it to finish. Belinda is utterly smitten with the beef kimchi on rice. "Ohhhhhh," she says letting out a moan of pleasure. "So good!" is all she can say. The beef is lusciously soft and spicy with judicious amount of sweetness to it. I ask Ellyn about it. 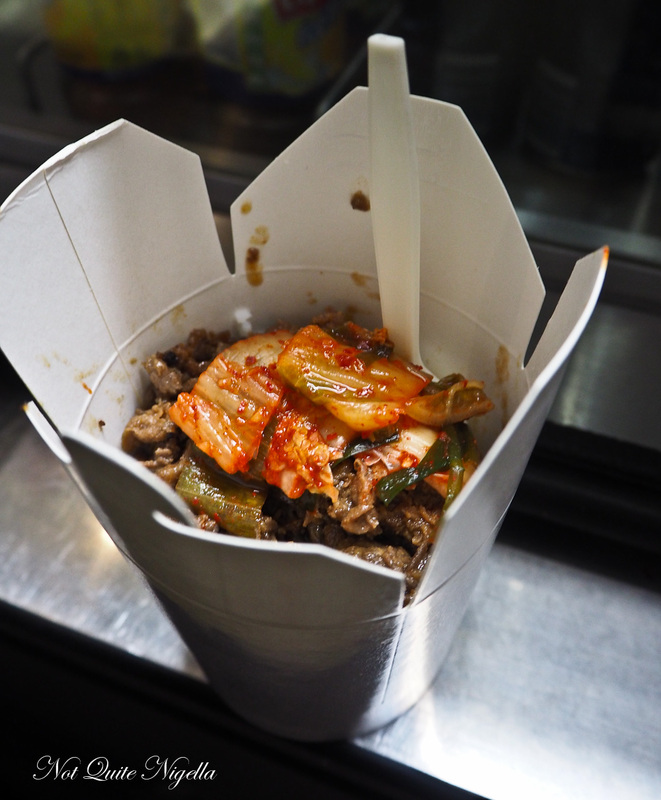 "The beef is taking homage from one of my favourite cuisine of all time – Korean. I used to live next to a really wonderful Korean lady as a neighbour who taught me a few tricks, including the use of fruit purees in the marinade to tenderize the meat. The main fruit Korean uses is nashi pear, however I’ve also added pineapple puree and kiwi puree as I love the extra flavour and kick they impart to the beef. Once marinated with other spices and sauces, the beef slices are slow-cooked to retain their moisture," explains Ellyn. You can bet I'll be trying that at home! I also ask Ellyn about the challenges of running a food truck. "When you are operating a food truck you are also exposed to the higher possibility of equipment throwing tantrums mid-operation – often due to the equipment being turned off and on all the time, forgetting to bring an item or two when going back for supplies is out of question, and being in a completely remote location where there is not even a phone signal to call for help if anything goes wrong." Our last stop is in front of Customs House. 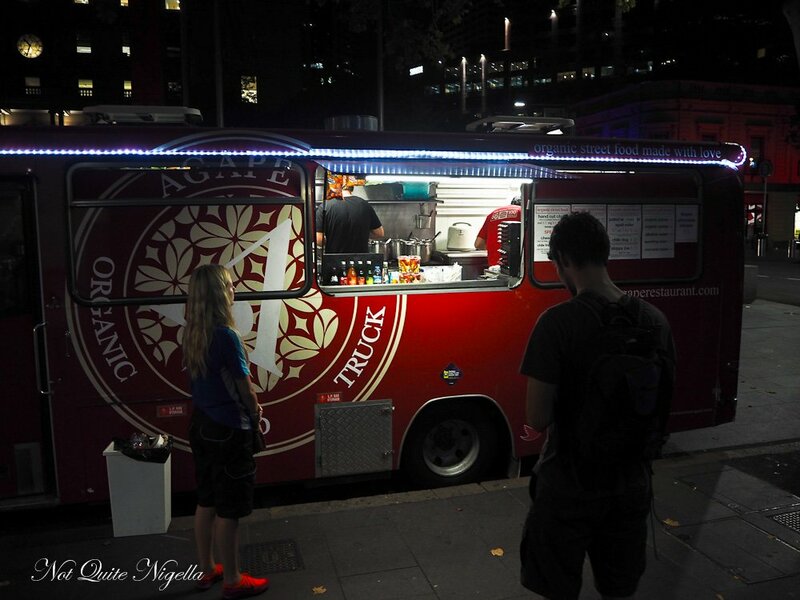 Agape was part of the first wave of City of Sydney food trucks that started almost three years ago. Their tag line is "organic street food made with love". 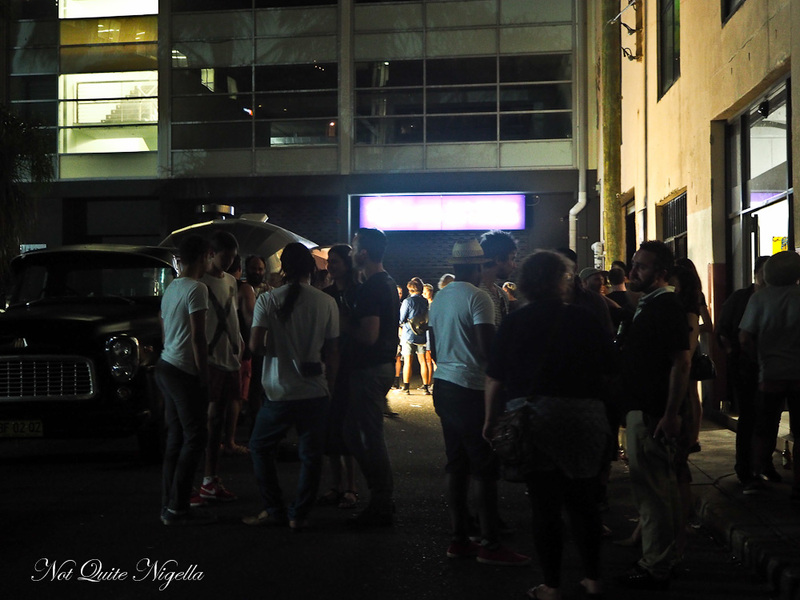 This evening it sits right next to another truck but Agape's line has a queue whereas the other one remains comparatively quiet. 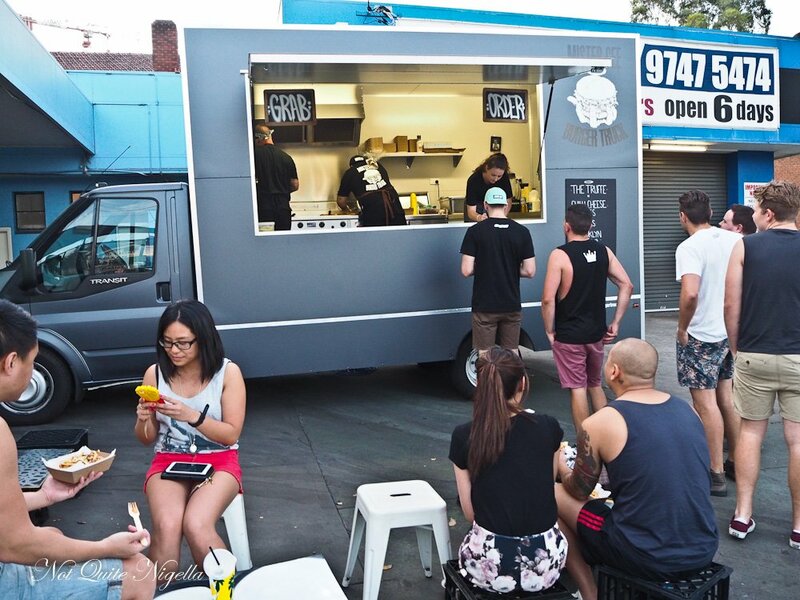 The menu at Agape is surprisingly large for a food truck with many options starting from $5 well priced for organic food that seems to always come at a premium. Agape's Simon Lawson explains, "My inspiration for our menus comes from what we get from our farmers and suppliers. It can be challenging especially as organic produce is so reliant on weather. Having a very seasonal organic menu keeps us on our toes." Simon says, "Our passion has always been to create a food truck and restaurant that breaks down the barrier that organic food is expensive. We only use organic, biodynamic, local & sustainable produce. A strong focus on wholefoods, nutrient dense, healthy, seasonal and as local as possible. 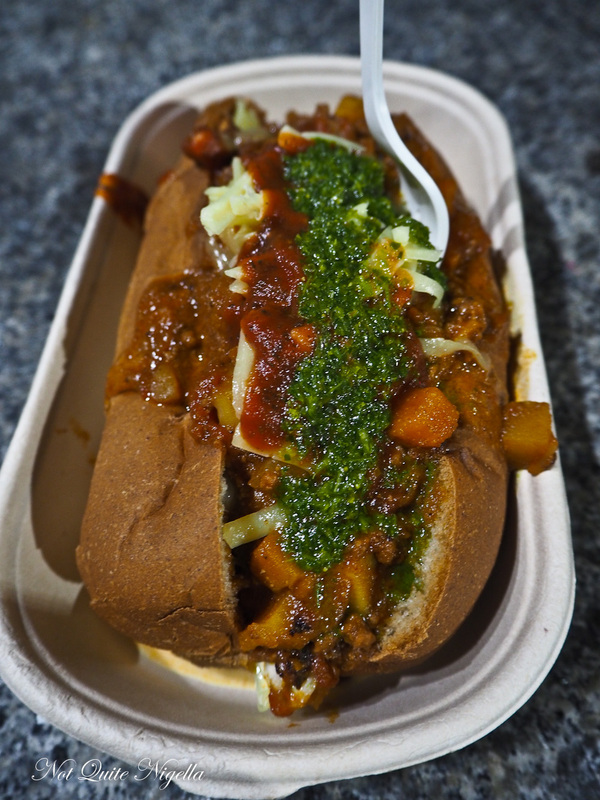 With our food truck we wanted people to see that organic street food can be delicious, quick, healthy and great value. We mostly source our organic produce directly from farmers and producers breaking down whole animals ourselves." While a lot of people seem to order the hand cut fries, we go for something a bit more filling. 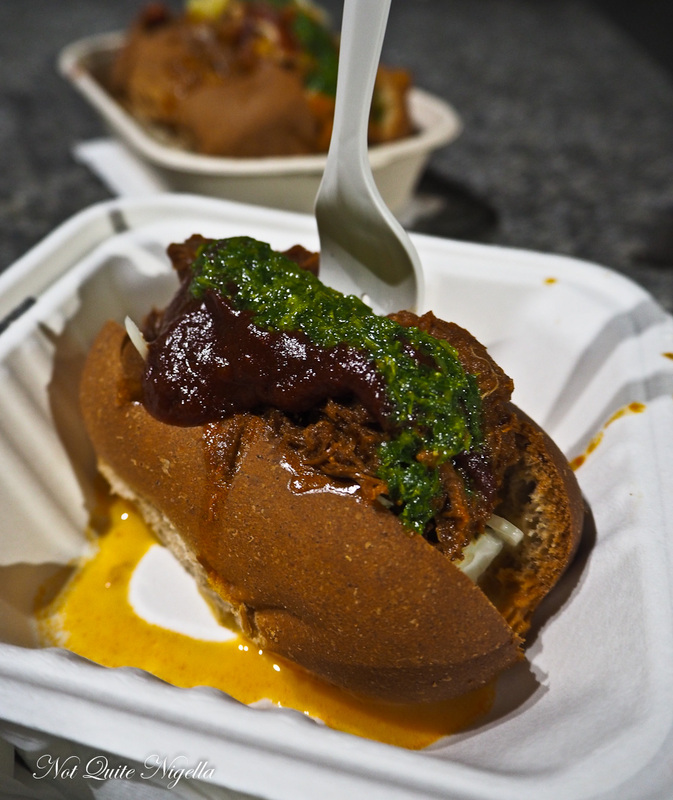 One of the best sellers is the slow cooked pork, served on a mini spelt roll (or roller) with coleslaw, chimichurri with a tomato barbecue sauce. It's good and a nice size for a small late night snack. Spelt is a low gluten flour and the buns are a good alternative for those that are gluten sensitive (but not intolerant as it does contain gluten). With an unmistakable sweetness, this grass fed beef and potato curry is as the name promises a little sloppy to eat (hence the name) but you forget about that because it's pretty damn delicious. The spelt bun is soft and fresh and the curry is topped with a chimmichurri, cheddar cheese and cheese while there's a layer of shredded cabbage underneath. Even though we have trouble finishing this given how much we've eaten, Mr NQN is so smitten that he carries this home in the car to have the next morning. Because of course tomorrow is just another day for eating! So tell me Dear Reader, have you tried many food trucks? Would you prefer to visit one at a permanent location or do you enjoy finding out where they are and following them? Do you use the app or follow them on social media? All meals were independently paid for. restaurant7 Delicious Sydney Breakfasts Beyond Bacon & Eggs! restaurantMeet My Suburb: Summer Hill Food Tour! restaurantFive of Sydney's Most Talked About Sandwiches! restaurant Meet My Suburb: Summer Hill Food Tour!